A compound bone with winglike processes, situated at the base of the skull. the bone at the base of the skull, anterior to the temporal bones and the basilar part of the occipital bone. It resembles a bat with its wings extended. 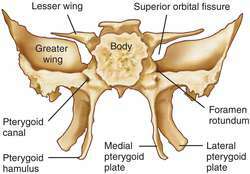 Also called sphenoid. A bone of irregular shape occupying the base of the skull; it is described as consisting of a central portion, or body, and six processes: two greater wings, two lesser wings, and two pterygoid processes; it articulates with the occipital, frontal, ethmoid, and vomer, and with the paired temporal, parietal, zygomatic, palatine, and sphenoidal concha bones. The wedge-shaped, bat-like central bone of the base of the skull. A bone of irregular shape occupying the base of the skull. n the single midline cranial bone with a body and several pairs of processes.